Preston’s road trip is off to a great start. Preston visited his blogging friend, Oliver Tates, when passing through New Jersey. Preston also met his 1-year-old cousin Deana for the first time and learned that babies are not as scary as he previously thought. 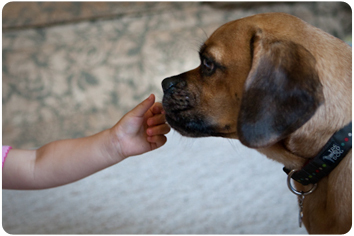 They give treats…very generously. After leaving New Jersey, Preston’s next stop is Philadelphia. Of course Philly Cheesesteak is on the must-do list. Preston is here to settle the famous Philly Cheesesteak rivalry between Geno’s and Pat’s. They are located across the street from each other. We are loving your posts of your journey to TX. Keep it up if you can! My Mama is officially addicted to seeing what and where you and your parents are getting to visit. You and Oliver Tates look like you two had a blast together. Jack is handsome too! Please be sure to email me if you happen to past through Austin before getting to Houston. We would love to see meet you! 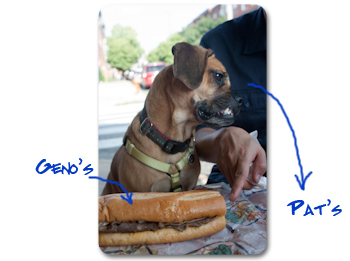 OMG…two famous cheesesteaks… how did you resist getting seconds? We’re guessing you liked Pat’s better! Can we have Gino’s?! You’re having a fun trip as you drive to TX, Preston! Looks like you and your 2 leggers are starting off on a great journey! I bet there are a lot of new smells along the way. How great to get to visit your friends along the way, too! Keep up the blogging. Looks like you’re having a great time on your road trip. When you get really south, please don’t underestimate the heat and humidity. It can sneak up on you! Be OVER-prepared and drink lots of water! Have water with you at all times. You and Oliver are twins! Looks like your visit was so fun! Jack is adorable huh? I can’t believe you are doing and seeing such fun stuff on your trip! Mommy was saying last night that when we take our road trip, I’ll be lucky if I get to stop at Rest Stops BOL! Glad you settled the Pat’s and Geno’s rivalry!! If anyone knows best, it’s you Preston! 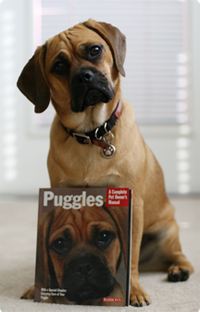 Well Puggle Preston it looks like you are having a Barking Great time on your Adventure! Thanks for sharing. You and Oliver do look a lot alike. And Jack is so cute. Let me see on the sammies, I will take Geno’s, no wait I will take Pat’s no maybe Geno’s I mean Pat’s, O’man either one would be fine really! Snicker! Snicker! If you come by Chicago, IL USA drop us a line and maybe we can get together. That would be Great! Well have to run Birthday Pawty is this Saturday (7/24/2010) I will be 3 human years. Traveling Mercies for all three of you! Hi Preston! I live in Jersey too, right outside of Philly, but I’ve never been to Pat’s or Geno’s:( My Mommy prefers Pat’s so she thinks you have excellent taste 🙂 I hope you liked my part of the country-enjoy the rest of your trip! Wow, Preston – you’re having an action-packed road trip! That is so cool that you got to visit a blog friend – and then that cheeseteak!!!! YUM!!! I’m so jealous! 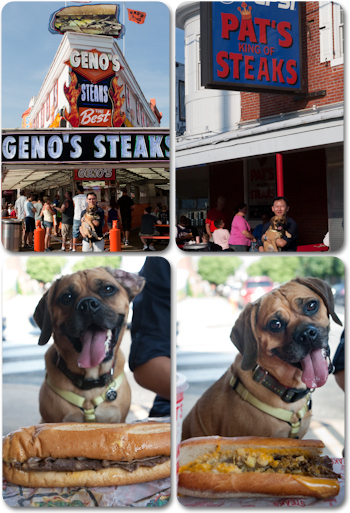 You got to meet Oliver Puggle AND eat a CHEESESTEAK!? You are one lucky dog. I want to live with you. 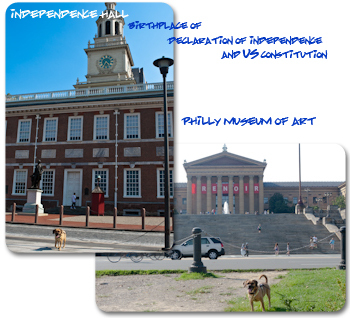 You’re such a lucky puppy that you get to go to so many great places, Preston! I’m sure that’s because you’re such a good boy.